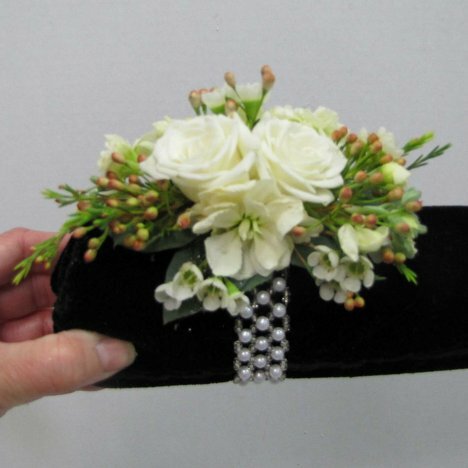 This corsage is easy to complete and fills in quickly with final snippets of wax flower. 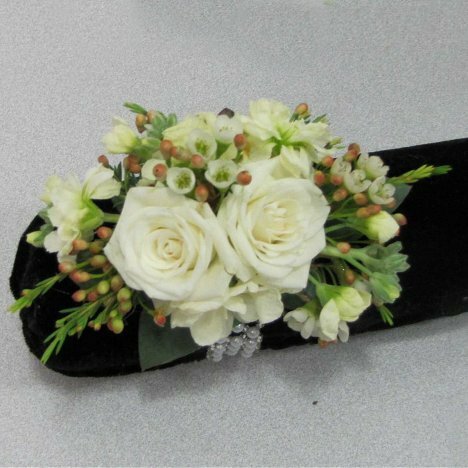 Don't forget to use the unopened buds at the tip of the stock flower - it adds quite a bit of interest and texture to your corsage design. Always hold your wrist design up and check out the sides to be sure there are no holes that need to be filled in. An oval shape will gracefully fit all wrist shapes and give an elongated look to the hand. 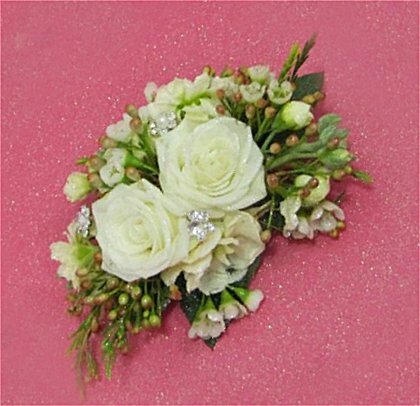 If you'd like, you can add in extra sparkle and shine with a few flower jewels or a quick spray of flower glitter spray. 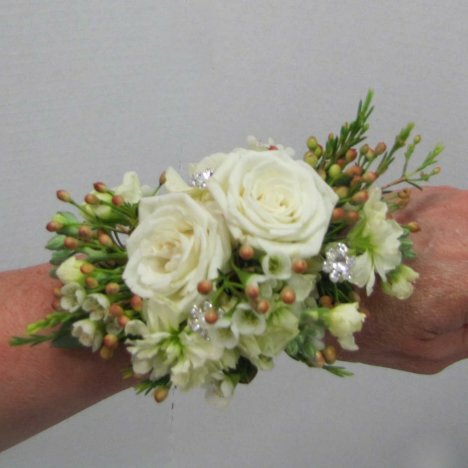 You'll notice that I did not add any ribbon to this particular wrist corsage. 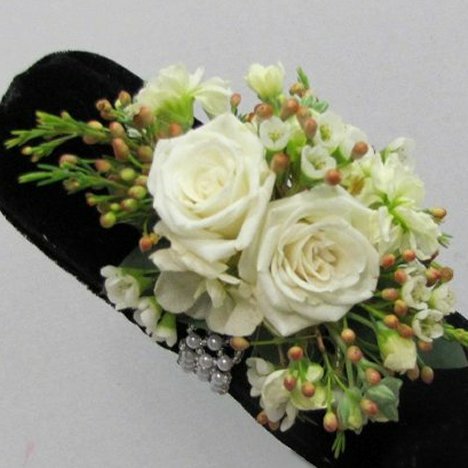 Ribbon can have a tenancy to date a corsage look. Usually grandmothers like loops of ribbon in their design, while younger wedding guests and mothers opt for no ribbon in the design. Either way, it's easy to make your own beautiful designs match the look of a professional without the high cost. 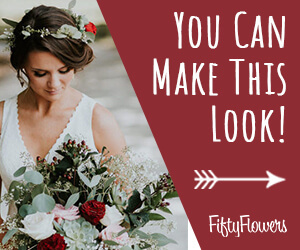 With wedding corsages running anywhere from $30 on up, making your own corsages and boutonnieres can save a lot on your flower budget. I always finish all my fresh flower work with a good misting of Finishing Touch. 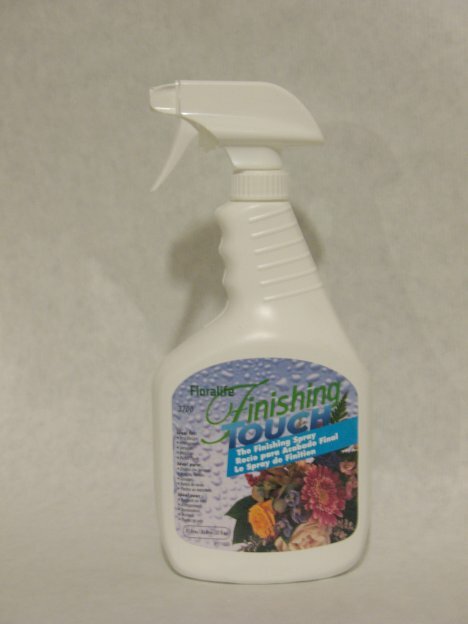 This is a flower sealant that helps delay petal transparency and early wilting of flower heads. 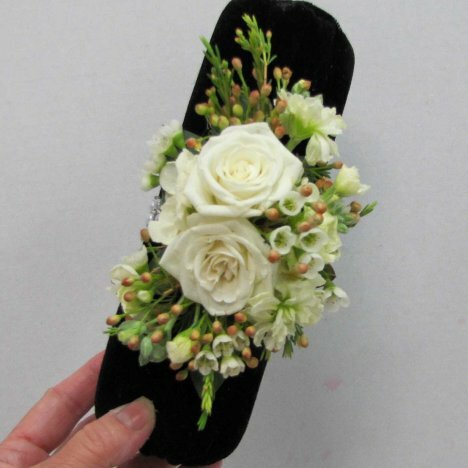 Since corsages and boutonnieres have no water source, this is a good way to hydrate thru the flower petals. Mist well and allow to dry before placing in refrigerator. Mist again before taking flowers to church or ceremony location.